Why Is My Dishwasher Making A Knocking Noise? Dishwashers can be noisy - it takes a bit of homework to find dishwashers that are generally quiet. But there are different kinds of noises that dishwashers make and if you know the differences between them, you'll save yourself some time worrying if that noise is the sound of a problem. Grinding - The motor in a dishwasher may make grinding noises when it goes through specific cycles. This is normal. Buzzing - When the water in the dishwasher is forced down the drain - the normal sound that it makes can sound like it's buzzing. Humming - This is the sound most of us are familiar with in our dishwashers. During the regular washing cycle you will usually hear a humming sound. Sometimes it's very low, other times it can be quite loud, which may indicate a problem. If you hear a high pitched humming sound - that may also indicate a problem. Squealing - This is often heard in brand new dishwashers and it occurs during the first few times that you run it. Nothing to worry about here. Clicking - Is usually a normal sound in some dishwashers. It's coming from the electronic control panel and it's nothing to worry about. Rattling - If it sounds like the items in the dishwasher are rattling while it's running - then there's nothing wrong except maybe your placement of these items. But, if the rattle sounds are not coming from what's inside then the sound may be due to a problem with the motor. We recommend that you have your dishwasher inspected. Knocking - The most common reason for a knocking noise is that the spray arm is hitting something. If you notice that this only occurs occasionally - that's probably the reason why. 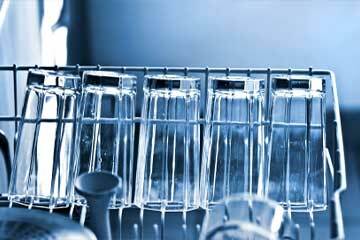 If you hear a knocking noise every time you turn on the dishwasher - then we recommend that you have it inspected. Clunking - That clunk that you hear is usually the detergent cup opening to dispese the cleaning product. It's quite normal. Banging - This is usually due to a water hammer problem. This means that the banging noise is produced when running water hits a closed valve - that is supposed to be an open valve. When the water hits that closure, and essentially has nowhere to go it creates a loud thud. Water hammers should not be ignored because in time, they could cause some serious damage to your water pipes. Call a professional plumber right away. Snapping - This sound can be due to normal sounds that mechanisms make in the dishwasher while it's running OR it can be the sign of a problem. Again, we recommend you call in a plumber if you hear a snapping sound from your unit. Swishing - The most normal sound from your dishwasher is the swishing sound which is usually the water as it's spraying inside your unit. Thumping - It could be that like the knocking noise, a thumping noise could be the spray arm hitting something. If you determine that is not the case, then the problem could be with the drain line behind the unit. If the latter is the case, call in a professional appliance repairman. Knowing what the causes of these sounds are, their possible origins will help you to determine if the noise requires a pro's help or if it's just the normal sounds of your dishwasher doing it's job. If you have any questions about plumbing issues, call Atlantis Plumbing today at 770-505-8570. We are available 24 hours a day, 7 days a week.